Welcome to Trump Watch, your weekly guide to the president and the law. The White House’s top lawyer, Don McGahn, is on his way out; what’s next? Also, there’s been a steady trickle of departures from the White House Counsel's office. How much should we read into that? Plus, lawyers react to Jody Hunt’s confirmation as head of the DOJ’s Civil Division. I'm also be watching this developing story from the special counsel's office. W. Sam Patten, a Washington lobbyist and political consultant, was charged with failing to register as a foreign agent over his consulting work for a Ukrainian political party. Patten is also reportedly a former associate of former Trump Campaign Chairman Paul Manafort. Pundits were bracing for action today in the Mueller investigation. Is this it? ➤➤ Have a hard time keeping up with the news? I’m highlighting some filings and courtroom developments this week, down below. 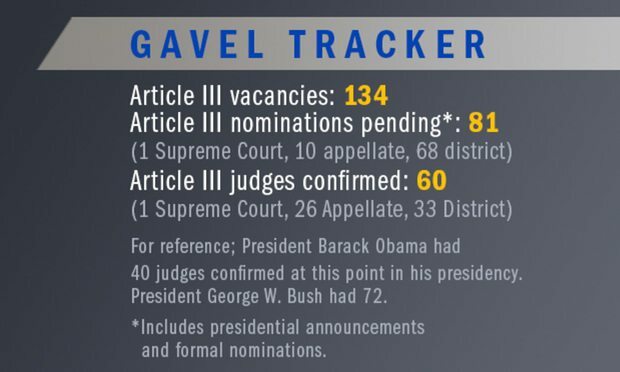 Stay up to speed on all of Trump’s judicial nominations and confirmations with our Gavel Tracker, also below. Happy (almost) Labor Day weekend. Thanks very much for reading, and let me know what’s on your mind: You can find me at ekim@alm.com, or on Twitter. 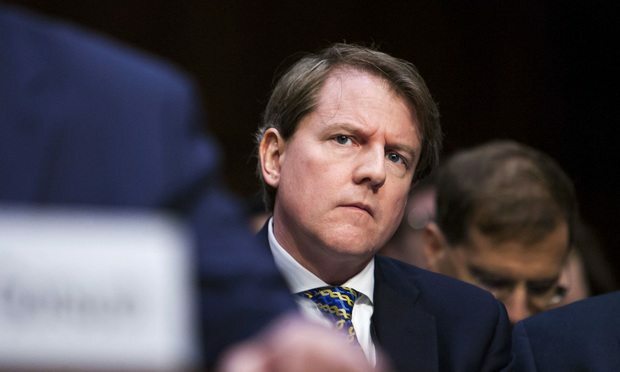 What’s next for McGahn? That isn’t clear. There have been rumors he could return to Jones Day, where he helped build up its political practice. As for his legacy, allies and critics alike of the oft-embattled lawyer say a key piece is his reshaping of the federal judiciary. Who will replace McGahn? That’s not entirely clear either, although Emmet Flood has emerged as a front-runner. Flood, a former Williams & Connolly partner, has served as a lawyer inside the White House since May, and has maintained a relatively low profile there. There are people who are pushing in Flood’s favor, with allies suggesting to me that if Flood assumed McGahn’s role, he would be able to keep up his responsibilities as the top White House lawyer, as well as managing the White House response to the Russia probe. ➤➤ McGahn’s departure has brought some renewed attention to the revolving door of lawyers at the White House, reviving the question: Is there a brain drain at 1600 Pennsylvania Avenue? Today is the last day at the White House for Stefan Passantino, White House deputy counsel and the top cop on ethics and compliance issues. His departure has been planned for some time, as I reported last month. But Passantino follows three other deputies who’ve already left: Makan Delrahim, who is now at the DOJ antitrust division; Gregory Katsas, who is now seated on the D.C. Circuit; and Uttam Dhillon, who is over at the DEA. How much should we read into the stream of departures from the White House legal shop? The view from the Trump side: Over the last few weeks, I’ve spoken with sources close to the Trump White House Counsel’s Office, and they’ve all stressed to me that the stream of departures are normal. McGahn front loaded the office with staff to jump-start work there, and staffers are leaving now that there’s a full-running operation. They're either heading for other government posts, or decamping to private practice. That might be true, but departures still mean disruption at the office, former Obama White House Counsel Neil Eggleston told me last month. There was a steep learning curve for the lawyers who entered the White House last year, and “it’ll be hard to replace them with people who will bring things back up to speed quickly,” the Kirkland & Ellis partner said. ➤➤ Look out for who, if anyone, replaces Passantino. He led the White House’s ethics and compliance shop from the start, with the help of two lawyers: Scott Gast and Jim Schultz. With Schultz gone—he left for Cozen O'Connor last year—Gast has been seen by a few in the White House as a natural successor. Gast jumped over to the White House team in January from the Office of Congressional Ethics. Before that, he spent seven years at Covington & Burling. ➤➤ Meanwhile, here is my look at John Eisenberg, who will soon be the last standing deputy counsel. He’s the top national security lawyer within the White House, a role that’s at times thrust him into the administration’s big controversies. And he’s a former Kirkland & Ellis partner (we’ve got his financial disclosures), with some DOJ experience under his belt. The DOJ’s Civil Division now has a Senate-confirmed head. Senators confirmed Jody Hunt on Tuesday, by a 72-23 vote, as the assistant attorney general of the Civil Division, the DOJ’s largest litigating division. The staff, consisting of over a thousand lawyers, represents federal agencies and Trump administration policies in civil litigation in the courts. Hunt served as Attorney General Jeff Sessions’ chief of staff; he’s also a veteran of the Civil Division where he spent 15 years as director of its Federal Programs Branch. “Trump’s legal appointments haven’t been as bad as many of the others. If he doesn’t care about it, the pros are able to sneak in qualified candidates. Jody is a career DOJ attorney and a good guy. I trust him,” tweeted Mary Carney, another former DOJ lawyer. ➤➤ The Paul Manafort legal drama continues. In Virginia, prosecutors are weighing whether to retry the ten counts that resulted in mistrials, and they’ve got some more time to do that after Judge T.S. Ellis III agreed to let them wait until he rules on defense attorneys’ pending post-trial motions seeking a judgment of acquittal or a new trial. ➤➤ With the D.C. trial looming, Manafort is looking to transfer it over to Roanoke, Virginia, where his legal team is hoping to pull from a jury pool that isn’t as saturated with liberals, and where they say media coverage of Manafort has been less intense. Next week, lawyers are back at the E. Barrett Prettyman courthouse in D.C. for a pretrial conference hearing. That’s set for the morning of Sept. 5. ➤➤ The DOJ is taking the transgender military ban case to the D.C. Circuit. Government lawyers notified U.S. District Judge Colleen Kollar-Kotelly in D.C. this week that they’re appealing her decision to keep an injunction on the Trump administration's policy in place. The government has also appealed a similar ruling in Seattle to the Ninth Circuit. ➤➤ Arnold & Porter is representing a Guatemalan mother whose 18-month-old daughter died while they were held in a Dilley, Texas, immigration center. They say the daughter, Mariee, contracted a respiratory infection when she arrived at the center, and never received the appropriate medical care. “#JusticeforMariee will involve lawsuits to hold those responsible for Mariee’s tragic death to account. But it also means ensuring that this never happens again,” R. Stanton Jones, a partner at the firm, wrote on Twitter. ➤➤ The ACLU says it’s “investigating and exploring possible legal steps,” after a Washington Post story this week described U.S. officials denying passports to American citizens along the U.S.-Mexican border. “The Trump administration’s attempt to deny passports to long-term American residents living in border areas is just one more inhumane act in a series of unlawful actions,” Lee Gelernt, deputy director of the ACLU’s Immigrants’ Rights Project, said. Thanks for checking out our Gavel Tracker. How do we count up these numbers? The count on Article III pending nominations is the sum of all of Trump’s nominees to Article III courts, including the U.S. Court of International Trade. Our court-by-court breakdown, however, only looks at Supreme Court, appellate, and district court nominees. Additionally: Our figure for pending nominations includes nominations for future vacancies, as well as existing vacancies.